Synopsis: A truly beautiful book about the summer that changed one girl's life, as her mum leaves home, travellers set up camp in the family's field, her older brother goes off the rails, and she falls in love for the very first time. Opening with a funeral, Iris is mourning the boy in the casket - but who is it? Sam, her tearaway brother, or Trick, her tentative boyfriend? Over one long hot summer, we find out just how their three lives were turned upside-down. CJ Flood’s debut novel follows a relationship as ill-fated as Romeo and Juliet. Infinite Sky is driven by the inevitability of conflict in the aftermath of a blossoming friendship between Trick, an Irish Traveller and thirteen-year-old Iris, upon whose land he is illegally staying. Much like Shakespeare’s most famous tragedy, Iris is forbidden from meeting Trick by her father, whose prejudice against travelers and barely supressed rage brings him to hate a family who aren’t so dissimilar from his. Only a terrible accident can begin to resolve the deep-lying issues between Iris’ father and Trick’s parents. Trick and Iris, as thirteen and fourteen year-olds experiencing their first love, are wonderfully crafted; Iris as a strong, independent young woman whose family lies in tatters in the aftermath of a messy separation. She, unlike her father, is fascinated by the contrasting lifestyle of the Travellers. Trick, equally, is a strong yet sensitive young man torn between following his father and living a “normal” life, and he cares deeply for Iris, even if it isn’t always obvious to her. Sam, Iris’ brother, makes an interesting extended cameo, and his ‘fall from grace’ becomes an integral part of the story and illustrates just how devastating parental separations can be. Flood’s prose is surprisingly simple and easy to read, yet it exudes richness and beauty. 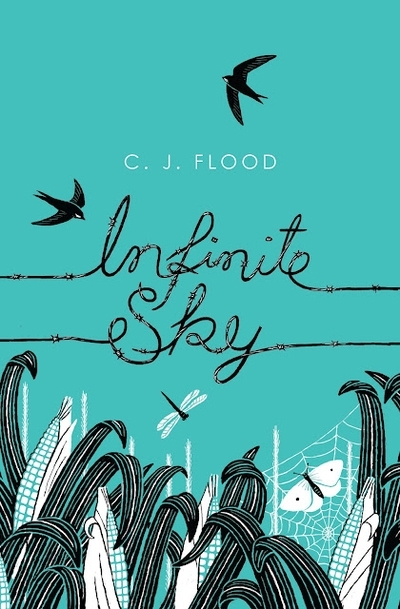 As a bildungsroman, Infinite Sky is unpretentious, experiential and heart-warming. It’s a novel that you can’t bear to finish with characters you can’t bare being hurt. Flood’s heart-wrenching debut is a modern Romeo and Juliet, exploring the innocence of first love and the consequences of prejudice. Infinite Sky is highly recommended.